SOLD 4231 E. English Dr.
Great location! 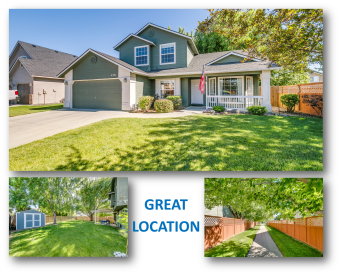 Near Village, Kleiner park, shopping, freeway access & more! Next to Walking path (no side neighbor). Exceptional floor plan w/vaulted living rm & separate spacious family rm! Built by Aspen Homes, 3 beds up & 1 on main level (use as office)! Kitchen opens to family room & has view of fully fenced & landscaped rear yard complete w/shed, mature landscaping & covered patio! Also features; covered front patio, private master bedroom w/full bath & walk-in closet, oversized garage, newer furnace & AC & more. RV GATE. Move-in ready.